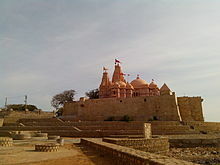 Koteshwar is name of an ancient Shiva temple located at the western tip of India in Lakhpat taluka, Kutch District of Gujarat. The story of Koteshwar begins with Ravana, who won it as a boon from Lord Shivafor an outstanding display of piety, this Shiva linga of great spiritual power. But which Ravana, in his arrogant haste, accidentally dropped and it fell to earth at Koteshwar. To punish Ravana for his carelessness, the linga turned into a thousand identical ones, some versions of the story say ten thousand, some a million. Unable to distinguish the original, Ravana grabbed one and departed, leaving the original one here, around which Koteshwar Temple was built. The temple is also known as Kotilingeshwar Temple. Koteshwar is only 198 Kms away from Kutch Resort.